Ready to go big? The Big Island, which is twice as big than all the other islands combined, is a microcosm of the actual state of Hawaii. Marvel at this awe-inspiring and diverse island that features all but two of the world's climate zones and features a bevy of natural beauty - everything from white and green sand beaches to volcanic deserts to snowcapped peaks. There are seven districts on the Big Island: Hamakua Coast, Hilo, Kau, Kona, Kohala Coast, North Kohala, and Puna. 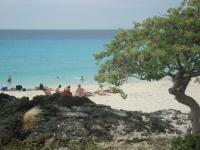 We offer the best Big Island Beachfront vacation rentals regardless of which area you plan to stay. Choose from beautiful beachfront home rentals or a fantastic selection of Big Island oceanfront condo rentals. Enjoy your Hawaiian vacation with all the luxuries of resort living and comforts of home. Select a beachfront Big Island vacation rental near Hilo's historic downtown area and take a walk along Hilo Bay, shop in the downtown area, or view the dramatic Rainbow Falls and Boiling Pots in the Wailuku River State Park. Head to the Kohala Coast and find Big Island vacation rentals with breathtaking views overlooking Pololu Valley's black sand beaches, or the green pastures of Wamiea's rustic country. A stay at one of our luxury beachfront Big Island beach house rentals provides the perfect Big Island getaway. 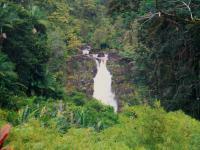 Revel in some of Hawaii's most breathtaking and accessible waterfalls along the Hilo and Hamakua Coast. Or, catch a few waves. If you're a beginner or even an expert, anyone can surf on the Big Island. From the Kona side (West) to the Hilo side (East), there are lots of great surf spots including Kahaluu, Lymans, and Banyans. If you're looking to merely kick back and catch a few rays, hit one of the many varied and beautiful Big Island beaches. The Kona coast is the sunniest spot in the United States, and as such, you'll find some of the best beaches in the country including Hapuna Beach, White Sands Beach, and Kahaluu Beach Park. Best of all, we've got plenty of stunning Big Island beach house rentals within a few blocks. If you're looking for a beach that's not as crowded, try Makalawena Beach, which isn't quite as accessible, but is easily one of the most beautiful, and Kekaha Kai State Park Beach, which was once privately owned. With a Big Island home rental from Hawaiian Beach Rentals, you'll find many unsurpassed luxury accommodations under Hawaii's bright stars. Offer Extravagant Amenities Our large selection of luxury Big Island oceanfront home rentals allows you to enjoy extravagant amenities that feel like home in this island paradise. 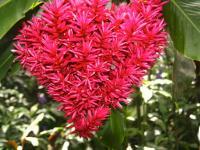 Our fantastic Big Island rentals will help make your stay an unforgettable one. Amazing features include gated communities, designer infinity pools, bedrooms with panoramic ocean views, designer kitchens, and necessities such as Internet and Wi-Fi access. Escape, relax, and if necessary, do some work. It's all possible with one of our Big Island beach houses. Finally, for those "cup of joe" connoisseurs out there, you'll find hundreds of coffee farms on the Big Island, including boutique coffee plantations in Kona, Kau, Puna, and Hilo. Once you watch the harvesting process of the unique Kona coffee bean and experience its flavorful taste, you'll never look at your morning's freshly brewed cup the same way again. From adventurous plans on the water to exciting treks in the mountains, you'll find the relaxing Big Island escape you desire. Securing a beachfront Big Island rental will give you a place to call home while discovering everything on this tropical paradise.